Colleagues, current and former students, area theater supporters gave the director-producer-writer who has taught at GW for 42 years one more standing ovation. An anthem about living life to the fullest and without regret, the tune may as well be the soundtrack of Ms. Jacobson’s life and career. The reception capped a day of tributes to Ms. Jacobson, who joined the GW faculty 42 years ago and has become a local theater legend through her work on and off campus. A performance of “Women's Works,” a selection of works by Ms. Jacobson, was staged at the Dorothy Betts Marvin Theatre immediately before the reception. Earlier in the day, theater professionals from across Washington, D.C., paid homage to her at a panel discussion moderated by Mary Ellsberg, director of the GW Global Women's Institute. “She is so well respected because she has devoted her life to using theater as a catalyst for social change,” Dr. Ellsberg said. Ms. Jacobson, who chaired the GW Theatre & Dance Department—now a program in the Corcoran School of the Arts and Design--for 13 years, has utilized her talents as a director, producer and writer to give voice to the voiceless—quite literally shining a spotlight on issues such as gender inequality, domestic violence and the immigrant experience. The founding artistic director of Horizons Theatre, she has presented more than 60 new plays to local audiences, many written by budding women playwrights. Her efforts to empower others through theater include workshops she holds at the local homeless advocacy organization Street Sense and an artistic exchange program she started with a youth theater in South Africa. “I have been so lucky to be at an institution that valued my outside work,” Ms. Jacobson said, praising GW for always encouraging her to pursue her artistic endeavors. Her family also has been supportive and among Ms. Jacobson’s biggest fans. Julia Barrett, B.A. 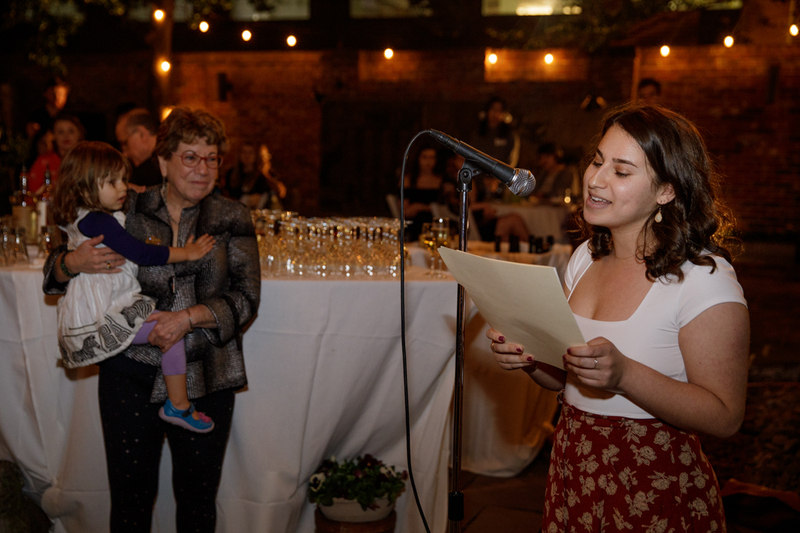 '18 and a current graduate student in the Trachtenberg School of Public Policy and Public Administration, sings a song from the play "Pippin"for Leslie Jacobson, who is holding her granddaughter, Phoebe. As the final curtain closes on Ms. Jacobson’s teaching career, adjunct professor of voice Millicent Scarlett said she will be missed by all but none more than her students. “I’ve seen her work with students, and she cares so deeply about them. She teaches simply for the love of teaching, and these days that is rare,” Ms. Scarlett said. Dozens of Ms. Jacobson’s current and former students were on hand to thank and celebrate her. To them, she is an original who will be difficult to replace. Sophomore Hannah Sturgis first met Ms. Jacobson when Sturgis was a high school student aspiring to be in the GW Theatre Program. Their bond was cemented then and has only grown stronger. “She’s always been there for me, encouraging me to follow my dreams and my passion for theater. She’s a wonderful woman all around,” she said. Those sentiments are shared by alumna Angelina Hoidra, whom Ms. Jacobson directed in “Vanishing Point” in 2014. Ms. Jacobson said the legacy she’s most proud of is the many students who have passed through her life and are now changing the world in their own special ways. Calling the outpouring of love she has received since announcing her retirement “humbling,” Ms. Jacobson said that though she’s leaving it does not mean there won’t be curtain calls in her future.